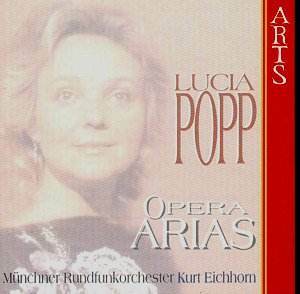 Lucia Popp was forty-three when she gave this recital, a co-production with Bavarian Radio. It shows her in marvellous voice in her early maturity, one that was to be so cruelly cut short a decade later with her premature death. The repertoire covers a cross-section of her roles and demonstrates uncommon linguistic and stylistic affinities. She has the very competent support here of the Münchner Rundfunkorchester under Kurt Eichhorn and a straightforward and unproblematic recording. One can hear, from the floated high notes in Die Zauberflöte, that her mechanism was in fine repair. This was always something of a wonder of Popp�s singing � and it never sounded like mere artifice or conceit � and was always at the service of the expressive and interior meaning of the text, as here. Her control of colour and intimacy of shading are exemplary in this aria � and note that she is now a Pamina and not, as in her youth, Queen of the Night. Technically what is so impressive is, inter alia, control of dynamics when going up; she maintains scrupulous dynamic gradients and seldom forces the voice. And there is quite enough power at the climaxes as well � both features that illuminate the Weber. It�s exciting to hear her Goetz as I wasn�t aware she had sung any. It�s as one would expect: carried off with idiomatic mastery and with just a hint of the soubrette still in the voice. Often in a mixed recital such as this there are points of relative weakness; a certain unfamiliarity with language or a rather generic approach. One never feels that with Popp. Maybe the Italian arias, though beautifully sung, are a mite reserved but it�s really only a matter of degree, a question of approach. Her French arias certainly seem to me impressive documents of her art and if one might perhaps have hoped for rarer repertoire then at least we get them beautifully sung. We end with her native repertoire � a really fine Smetana and one of her warhorses, Mesícku na nebi hlubokémt (O Silver Moon), from Rusalka. Popular though it is, too many sopranos come to grief over it, getting squally and unfocusedly torrid. Popp stays on the right side. This is very much a tribute to Popp � there are no texts and little other documentation. But I don�t really think it matters. This is most assuredly for her many admirers and they will find all her many virtues here, undimmed and untainted by time.